The thing I like about this hot air balloon mobile is that it takes very little glue to make. The balloons are held together primarily by weaving two star shaped pieces of paper together. 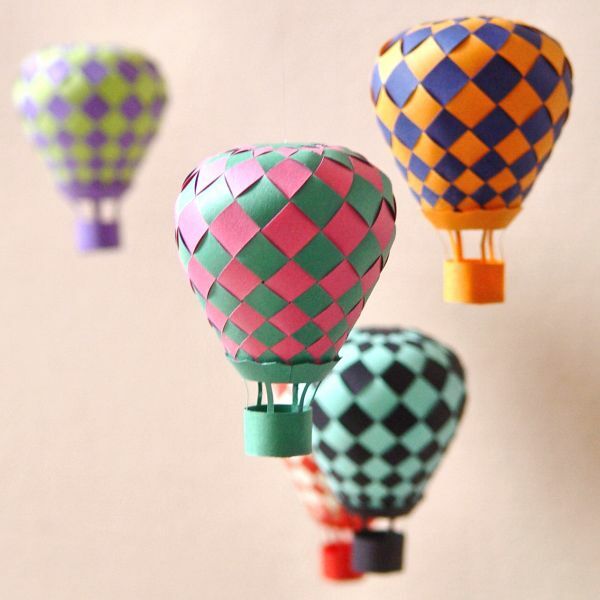 Lene at PaperMatrix found inspiration for creating these balloons from traditional Danish woven paper designs. 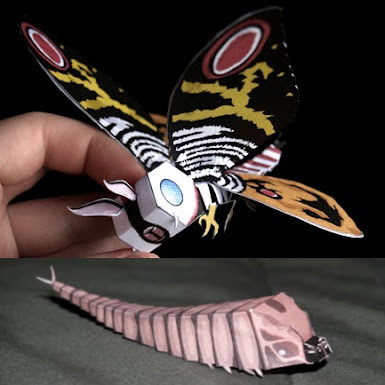 This Mothra papercraft (complete with larval stage) is one of six kaiju paper models available at papertoyadventures.com. Also available are Anguirus, Gamera, Godzilla, Gyaos, and MechaGodzilla. Mothra is one of the more popular kaiju characters in Japansese cinema and has appeared in seventeen movies to date. 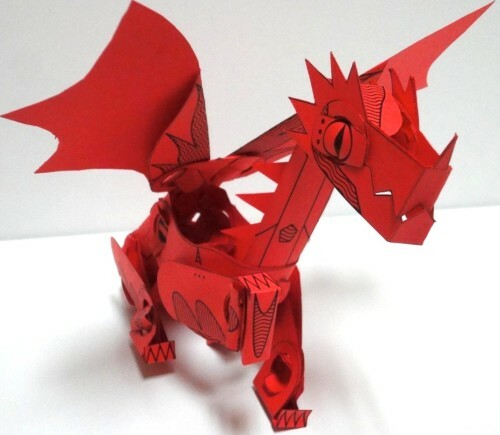 Netroids are poseable papercraft creatures that can be assembled without glue. Out of the four creatures currently available, this dragon is my fave. Other creatures include a raptor, a stegosaurus and an unicorn. PDF templates for each may be downloaded here. Printing the on color card stock is recommended for the best look. Due to their shape, Type II hand phasers from the Star Trek: The Next Generation television series have earned the nickname "cobra phasers". 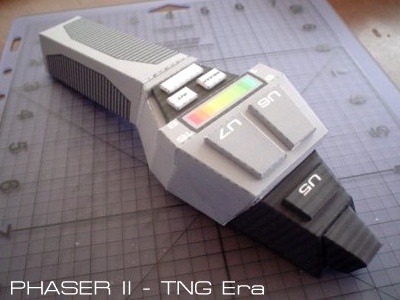 This 1:1 scale paper model of a cobra phaser was created by Michael Haggard in 2004. The template and instructions for the model may be downloaded here. 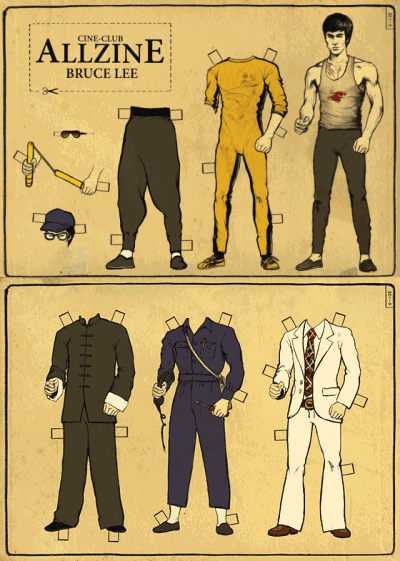 ﻿Offered for fun by the Allzine blog, here's a paper doll of martial arts icon, Bruce Lee. The doll's clothes are costumes from Lee's various movies. 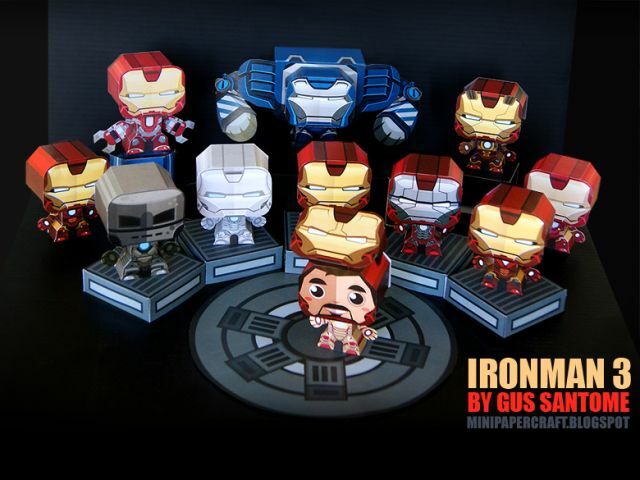 Printable JPG images for the doll are available here. On the same page is a Flash version of the doll that can be dressed without the need of printing or cutting. Bruce Lee died in 1973 from an allergic reaction to a painkiller. Including movies he did as a child, Lee starred in 25 different films. In the Adventure Time animated series the character Fionna has a crystal sword. 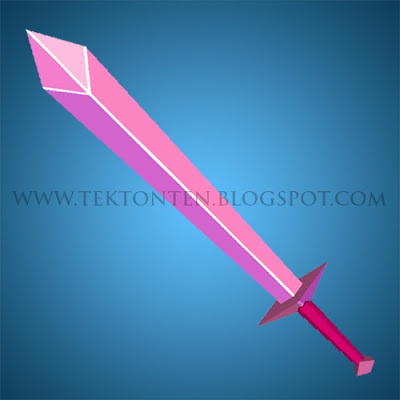 The Adventure Time wiki describes the sword as having the "appearance of a ruby" with a "pinkish glow" and also "retractable, akin to a lightsaber". The Pepakura PDO template for this full size paper model of the sword was created by aiko-chan14 and may be downloaded here. 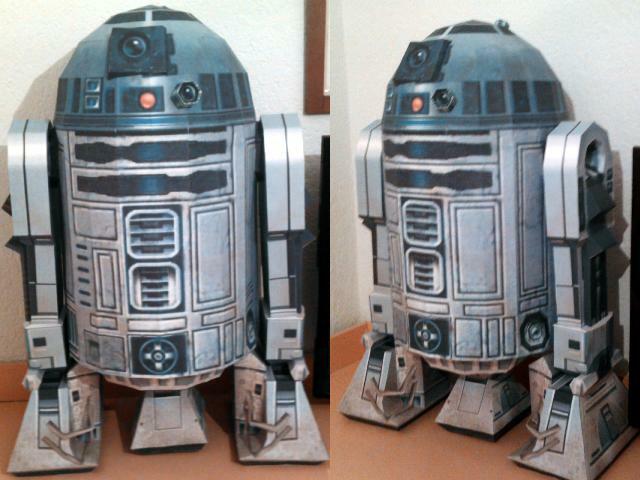 DeviantART member Adisko built a life-size papercraft of everyone's favorite Star Wars droid, R2-D2! The Pepakura PDO template for the lovable robot (available here) consists of 76 pages of parts and is sure to deplete the ink in your printer. 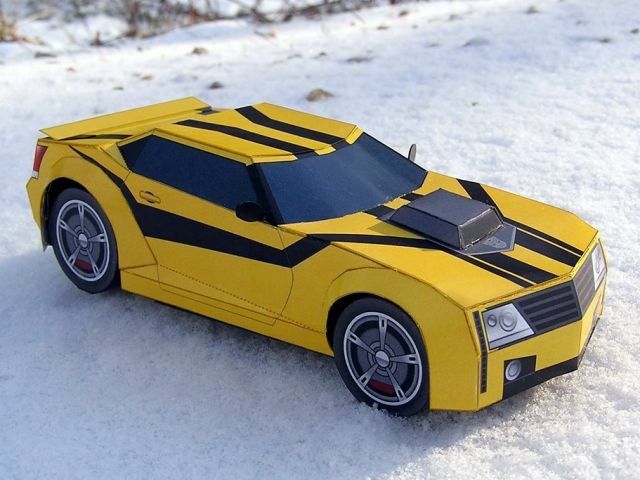 ;) The template is based on a 3D model by Ivanproff and unfolded by Cuguel. Along with C-3PO, Obi-Wan Kenobi and Anakin Skywalker, R2-D2 is one of only four characters to have appeared in all six Star Wars movies to date. 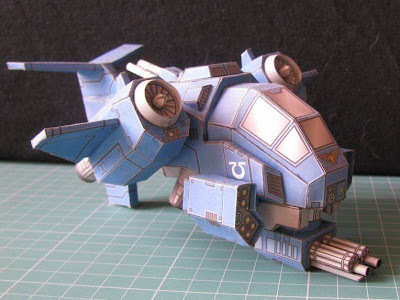 "An aerial interceptor and ground-attack aircraft that serves in the armies of the Adeptus Astartes. The Stormtalon possesses Vertical Takeoff and Landing (VTOL) capabilities which allows it to hover in place." This paper model is specifically an Ultramarines Chapter Stormtalon equipped with twin-linked assault cannons and Typhoon missile launchers. The PDF template for the model may be downloaded here. Build photo by Kotlesiu.